BBLearn is the required online learning system and electronic grade book utilized by the University of Idaho for all courses. In this course, BBLearn will be used for all types of assessment, including Assignments (also called 'Homework' in BBLearn), Quizzes, and Exams. The supplementary content to the textbook is found on this Weebly website. Throughout these pages, any place where you are required to go to BBLearn to complete a graded assignment, quiz, or exam, you will find a black button labeled 'BBLearn.' Whenever you see this button, you will know you must go to BBLearn, log in with your UI credentials, and complete the stated assignment, quiz, or exam. The first time you log into BBLearn and select this course, you will be asked to register or purchase Mastering Geography Access. If you purchased the hard copy of the book with the Mastering Access code card from the UI bookstore, this is where you register that code. Otherwise you MUST purchase Mastering Geography Access for this course online in BBLearn. You cannot purchase the Mastering Access Code anywhere else, because it is unique to the University of Idaho to work with our BBLearn system. Your cheapest textbook and access option is to purchase the eText and Mastering Access together at this purchase point (the total is only $71.50). 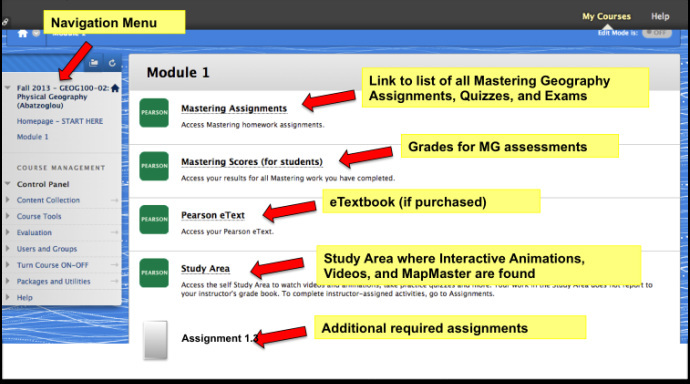 Mastering Assignments: this is where you will find most of your assignments, as well as your quizzes and exams. Click on this icon to view the list or calendar of quizzes, assignments, and exams. Mastering Scores: this is where you can access your grades from Mastering Assignments, but it will not include assignments that are on BBLearn outside of the Mastering Assignments page. All grades will be updated in the BBLearn grade book once per week. Pearson eText: The electronic textbook that you receive when you purcahse Mastering Geography with the eText. If you only purchased the Mastering Geography Access and a hard copy textbook, you may not have this icon. Study Area: this takes you to the textbook supporting resources that you will need to complete the modules, including Interactive Animations, Videos, and MapMaster. Additional assignments: occasionally, there will be supplemental assignments that are listed here that are also required, but are not part of the textbook-based Mastering Geography content. If there is an additional assignment listed for a Module, it is REQUIRED, unless otherwise indicated. Additional resources available in BBLearn include a discussion forum where you can ask other students and the instructor questions about the course, and list of announcements from the instructor, and the course grade book. All grades will be updated on BBLearn once per week. When you complete a quiz, assignment, or exam, you will be notified of your grade at completion. That grade will be available immediately via Mastering Geography, or within a few days in the BBLearn grade book.